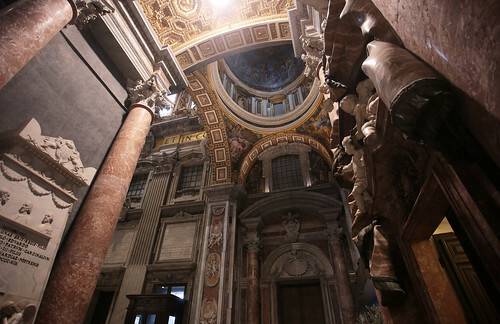 A visit to the St. Peter’s Basilica is an (almost) fixed stop for those who come to visit Rome, how to visit it at least once in life is virtually obligatory for those who live in Rome. I, after several years from the first time, I chose to come back at the end of December 2018 and today I would like to share some useful information with you. Let’s start with a little bit of history (yes, “we all know it”, but I think it’s right to begin by sketching it out). The Basilica of St. Peter is the largest of the four papal basilicas of Rome, with a total area of about 23.000 square meters, 218 meters long and tall (at the tip of the dome) 133.3 meters. 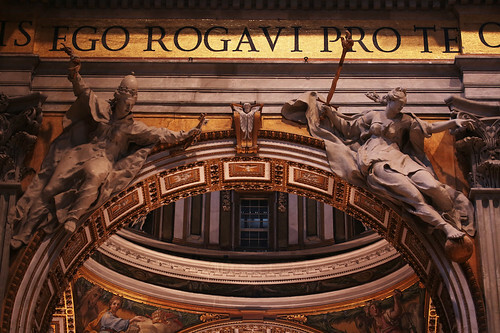 However, it’s not the cathedral church of the Roman diocese: this title belongs to the Basilica of San Giovanni in Laterano. It is often described as the largest church in the world and can hold 60,000 faithful (some sources speak, instead, of 20,000 faithful). The current basilica was begun on April 18, 1506, under Pope Julius II and ended in 1626, during the pontificate of Pope Urban VIII. The square is the work of Gian Lorenzo Bernini, who built it during the pontificate of Alexander VII, between 1657 and 1667. The square is divided into two parts: one has the shape of a trapezium, whose dominant side coincides precisely with the façade of the basilica; the second one, the biggest one, has an oval shape and in the middle, there is the famous obelisk. The renowned arcade “unites” these two parts of the square. Let us pause for a moment on the colonnade of St. Peter’s Square: do you know that there is a “centre” on every side? Indicated (indeed, indicated) by a plate on the ground, if you place yourself precisely at that point the double row of columns will seem like one. 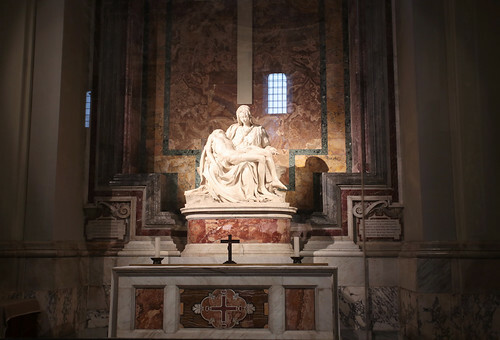 In the first chapel on the right, as you enter, there is the Pietà of Michelangelo, a work of youthful years. The work is protected by a glass case after a madman hit it in several places with a hammer in 1972. Now let’s talk about some useful information, in my opinion, for a visit to the Basilica. 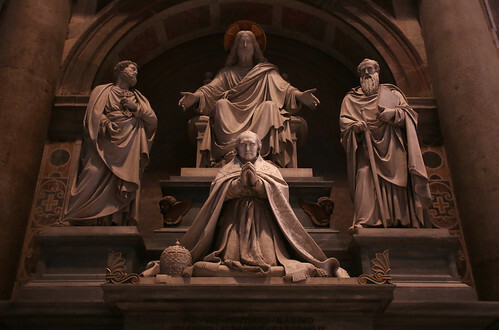 Ticket: admission to the Basilica is free. You pay only for a guided tour or an audio guide. I have decided to buy online (via ticketbar) a ticket “skip the line + audioguide“, which allowed me to visit San Pietro with the audio guide. Why did I make this choice? To speed up my stay in line, of course, and the audio guide to download directly to my phone (with the same ticket I could have a discount on the guided tour, but I preferred to keep the audio guide already included). I suggest you bring your headphones or earphones with you. Time in queue: every day there is indeed a long line, due to the many people who want to visit the basilica and, above all, to the security checks to be passed (under the right colonnade). The line usually runs quite fast, but apparently you have to consider the time when you line up (the longer the delay may be) and possible unexpected events, like someone a little slower or forget of the belt or to have coins in the pockets of the trousers (having to go back to eventually re-pass under the metal detector). Duration of the visit: the day of my visit you could not go anywhere, so I visited everything possible in about an hour. Considering also the tour to other areas such as caves and possible listening to all the audio guide stations, I would suggest you take into account at least a couple of hours (let’s say 1 hour and 45 or so). Taking the audioguide is worthwhile? In my opinion yes, although I expected some more historical news. 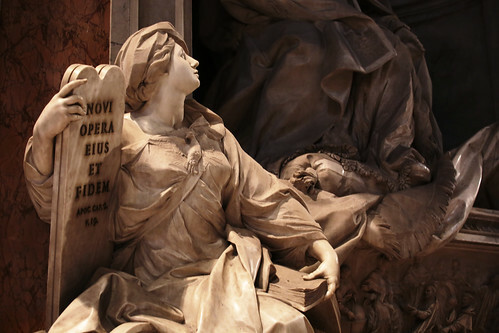 Not that I was sorry to hear all the religious aspects about the basilica (statues and frescoes and tombs included), mind you, I think there is always something to learn on any subject! Let’s say that perhaps some more historical information would have pushed me to spend more time listening to the audio explanations (instead of interrupting, often, looking before the explanation came to an end). For all useful information, you can refer to the Basilica’ official website.